Perhaps the most popular deposit method of all, Visa offers players a simple, quick way to get cash on to an online poker site. If you'd like to learn a bit more about how to use Visa to play real money poker, along with our pick for the best Visa online poker site, read on for our guide to playing online poker with Visa. With nearly all online poker sites accepting Visa, our top pick for a Visa poker room is the same as our overall top pick out of all online poker sites: 888 Poker and Bovada Poker (for USA players). Depositing at both sites using Visa is easy, the deposit minimums are low ($10 for most countries) and acceptance rates are reportedly quite high for players from most regions. When you take those facts and couple it with the overall quality the site offers to players, it's easy to see why we wholeheartedly endorse Bovada & 888 Poker as the best choice for playing online using a Visa card. You can be sure that your information is secure, and that your funds will arrive rapidly in your account. Best of all, there are absolutely no fees assessed by 888 on deposits made via Visa. A great room and a great deposit method is exactly what poker players are looking for so they can get online fast and spend their time at the tables - not in the cashier trying to figure out how to make a deposit. While Visa may be the most popular method of depositing for online poker players, that doesn't mean using a Visa to play at poker sites online doesn't have any drawbacks. There are actually quite a few; many players worry about the relative security (or lack thereof) involved in using a Visa card to deposit, as your credit card information ends up in the hands of companies you might not know much about. Others are annoyed by the somewhat frequent rejection of Visa cards for online poker deposits (depends largely on the issuing bank) and the low deposit maximums Visa allows when compared to methods like bank wire. Those drawbacks aside, Visa deposits remain very popular among online poker players. The disadvantages of employing Visa for depositing are apparently outweighed for most by the speed and convenience using a Visa allows; as opposed to bank transfers and ewallets, which can require a few days to complete a deposit, Visa deposits are often available within minutes of the completed transaction. Do All Poker Rooms Accept Visa Deposits? Effectively, yes. While there may be an exception or two lurking out there, the vast majority of online poker sites will allow you to use Visa to make a deposit. Note that Visa deposits from certain countries may be disallowed by certain rooms; you can either consult our review pages or contact support for more information about deposit options by individual country at a given room. How to Deposit to a Poker Site Accepting Visa? If you don’t currently have an account at the Visa poker room of your choosing, the first thing you will need to do is create your own poker account. This will only requires some minor personal information like your name, address and birth date. After you have created your account you will be able to make your first Visa poker deposit. Simply go to the banking or cashier section of the website and select the Visa option. This should only take a few seconds to clear and then the funds will be able for play in your account immediately. Many of the poker sites that allow real money Visa poker will give you a bonus just for making your first deposit. This bonus money can be used at the real money poker tables immediately, but you will need to play a certain amount of hands before you are able to withdraw at. Are Visa Poker Deposits Safe & Secure? 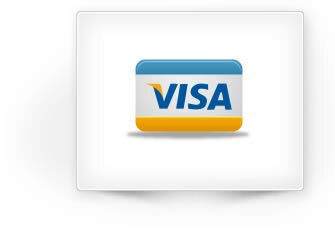 Users should feel completely safe using a Visa card to make an online deposit as Visa transactions are secured. The added level of security that Visa provides is another big reason for their popularity among US poker players. Additionally, while every online transaction carries its own set of risks, online Visa poker rooms process hundreds of thousands of Visa transactions a year without issue so you should feel safe in knowing they have done this sort of thing before and will continue to do it long after. Unfortunately, you cannot use the Visa card as both a deposit and withdrawal method. Most sites will simply send your withdrawal via a courier check or through a bank wire transfer. This is not preferable, but because of the current legal situation surrounding poker in the US this is the best that these sites can offer. We will let you know if this changes, but as of right now you cannot use your Visa card for your poker withdrawal. If anything, it seems as though Visa will become even more popular as a deposit method in the years ahead. Why? As more regions move toward regulation, online poker is quickly evolving from a disparate industry run by loosely regulated companies to a tightly controlled, highly-regulated one. As regulation spreads, banks become more and more comfortable allowing customers to use credit cards for online gambling purchases. That's an equation that should equal more and more use of Visa to deposit funds at online poker rooms by more and more players, a situation that should please players, rooms and those with a financial stake in Visa alike.